Dr. Tyler Conrad at Conrad Chiropractic is pleased to announce that he is now offering Class 4 high power laser therapy. This new therapy is non-invasive and proven to be very effective for many musculoskeletal conditions. Conrad Chiropractic has the only class 4 laser in all of the surrounding areas. The Diowave Class 4 laser treatments are safe, non-invasive, and can relieve pain and discomfort by up to 30% with just one treatment. For acute conditions 5-6 treatments is usually all that is needed and chronic conditions may need 6-12 treatments. Most patients notice a warm soothing feeling during their treatment, there is no pain associated with laser treatment. 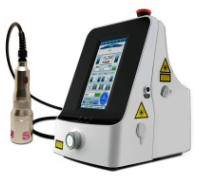 The high powered laser therapy accelerates the healing process and works at the cellular level through its ability to penetrate deep into the body’s tissues by which it reduces inflammation, increases endorphin levels, and it repairs damaged cells. This process then allows the body to heal at a much faster rate than normal. So, if you find yourself suffering from chronic back, neck, shoulder, knee, ankle, or hip pain Conrad Chiropractic can help. The top ten most effective treatments are: knee pain/arthritis, neck pain, plantar fasciitis, low back pain, trigger points, muscle spasms, shoulder pain, hip pain, hand pain, and elbow pain. Give Conrad Chiropractic a call today at 814-886-9414 located at 520 Church Street in Lilly, PA to see if laser therapy can help you!